(Minimum lease is 28 nights and there is NO 10 % OCCUPANCY TAX in Rancho Mirage when rentals are 28 nights or longer.) The ANA Inspiration LPGA IS HELD ON-SITE AT MHCC April 01 - April 07, 2019. OUR CONDO IS JUST A 6 MINUTE WALK TO THE 18TH HOLE OF THE DINAH SHORE COURSE. AND, JUST STEPS AWAY FROM THE OUTDOOR POOL AND SPA! Enjoy the Mountain views while relaxing in the lounge chairs under the desert sun! MISSION HILLS COUNTRY CLUB has a wonderful 'Spanish' look and feel, with stucco exterior walls and clay tile roofs. The unit is 1,049 sq. ft. with cathedral ceilings, a living room ceiling fan with upper and lower lights. The Villa is very clean, un-cluttered. The couch, matching love seat and ottoman are of old Spanish design. New 'Madrid inspired' porcelain tile floor. Fireplace is custom 'Old World' textured plaster with Mexican tile accents. The entire interior walls of the Villa was freshly painted in December 2016. Kitchen has been remodeled with all stainless steel appliances, including new glass top electric range and hood and new Quartz counter tops by Cambria. There are 2 telephones and 2 televisions; one 40' flat screen TV in the living room and one 32' with built-in DVD in the bedroom. On the dining room patio, there is a new high quality patio gas BBQ that will sear your steaks at 800 degrees, with an outdoor dining table and 4 matching chairs. The heated pools and spas are just steps away from the unit. If you like to cook and entertain, the 8 piece matching white dish set, Wolfgang Puck cookware, table napkins, etc. are all wonderful to use. WIFI is included. This unit would be perfect to escape to the desert and enjoy warm weather, sunny skies, relaxation, outdoor activities, bicycle riding on the 2 bikes provided for your use, beautiful scenery, the smell of fragrant flowers and grapefruits/lemons/oranges freshly picked from the abundant fruit trees growing throughout the Country Club and in the courtyard. After a full day of athletic activities and lounging, you are sure to have sweet dreams in the new Beauty Rest Heirloom 2018 California King bed set with new bedding and comforter and a new 4 piece Pottery Barn Bedroom Set. Keywords: Located in private gated 1700+ acre Country Club with lots of green grass, full-time landscape gardeners, fruit trees and flowers. Single floor unit, vaulted ceilings for an open airy feel, 3 patios all with mountain views, quiet end unit. Eisenhower Hospital is a 10 minute drive from our unit. El Paseo shopping is 20 minutes away. Stop along the way at College of the Desert on a weekend morning for fabulous deals on clothes, accessories flowers and food. Venture over to Palm Springs for dining and shopping, 15 minutes away. We enjoy outdoor activities and Mission Hills offers so many opportunities to stay active, such as swimming, water aerobics, playing tennis, golfing, and walking inside the Country Club's 1,700 pristine acres of perfectly landscaped property. Anyone leasing is encouraged to become a Member of the Mission Hills Country Club to enjoy the wonderful opportunity to meet new friends at the Club and to enjoy and participate in vartous levels of membership, such as social, tennis, fitness, and golf: all just out your doorstep! We also love the privacy and quietness of the unit and surroundings. 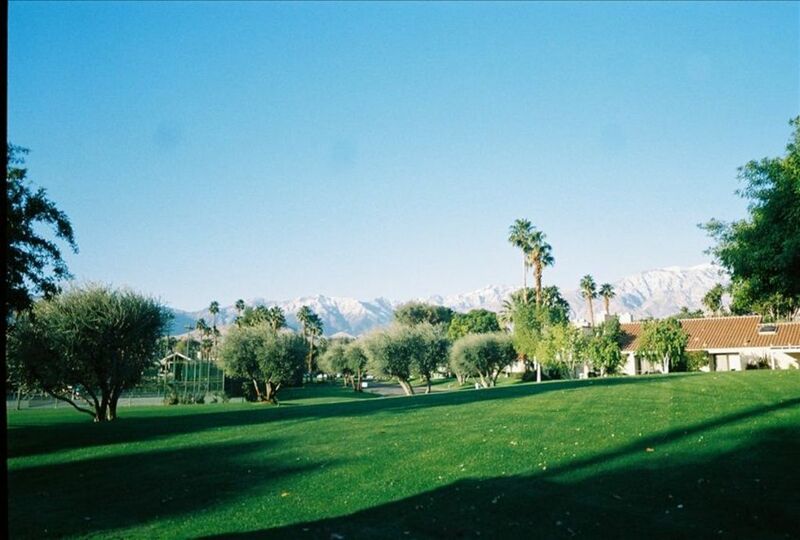 Mission Hills Country Club is conveniently located within 20 minutes from the Palm Springs Airport and is also close to shopping, theatre, fine dining and museums. If you love to play tennis, you can play tennis by signing up for Reed Anderson's Tennis School (clinics, private lessons, ball machine, etc.) You can play tennis every day at the Reed Anderson Tennis School located within Mission Hills Country Club. Contact Reed at 1-800-386-4107! Reed's Tennis School was voted Best Adult Tennis Camp in California for 2002-2012, 2014! I have been taking lessons from Reed for 20 years and for me, his school is the very best in the desert! Fees apply. Our unit is very private and has lots of rolling green grass to enjoy. We enjoy making coffee and sitting on the front patio, looking at the mountains (snow capped in winter) and listening to the birds sing. Very relaxing and most enjoyable! The quiet privacy and ambiance is so delightful! You can also play tennis every day on-site at Reed Anderson's Tennis School--call Reed for details and prices. Reed's Tennis School is a 5 minute walk from our condo! half bath for guests: toilet, Guest 1/2 bath features a sink, toilet & large wall mirror. Downtown Palm Springs is a 15 min. drive from Mission Hills Country Club in the famed Rancho Mirage area. Palm Springs has many new restaurants and shops! El Paseo in Palm Desert is 20 min. drive. Mission Hills Country Club is a 1,700 acre private Country Club in the heart of Rancho Mirage and is next door to the Mission Hills Westin Hotel & Resort and their public 18 hole golf course. Walk for 6 minutes over to the Mission Hills Country Club Golf Club House and you will see the 18th Hole of the tournament Course...SPECTACULAR!!! The views of the mountains are superb in the Spring, Summer and Fall months and glorious in the Winter when there is sometimes snow "Capping" the mountains. There is a wireless phone with answering machine in the kitchen and a second phone in the bedroom. 2 sets of king sized bed linens and 4 pillows for the bed. Whirlpool Washer with front load feature. Whirlpool Dryer with front load feature. Uncovered spaces are available for Lessees guests and a one car garage is available for Lessees. Single space car garage with lots of room for your golf clubs! Set of 8 bath towels, hand towels and wash cloths and 4 large white pool towels. If you want a wireless connection for your laptop, we have it! Sofa set with love seat, ottoman and matching chair with pillows. Stainless Steel Whirlpool Refrigerator with freezer and automatic ice maker. New electric range with glass top burners. Oven in the new electric range. A new electric coffee maker is provided. Wolfgang Puck 20+ piece cookware set (18-10 Stainless Steel). Set of 8 dishes. Electric ice cream maker. Electric Coffee Maker. Krups Electric Juicer. Blender, Mixer, etc. 8 piece white dishes set. A glass top dining table and 4 dining room chairs are provided. One large TV in the living room and a 32" TV with built in DVD in the bedroom. Both TVs have High Definition pictures. The unit has 2 high def flat screen TVs : a 40' Sony TV in the livingroom /32' TV with built-in DVD in bedroom. The unit has HIGH DEFINITION programming for the clearest picture possible. Lots of very beautiful green grass in the courtyard and front lawn. It is mowed each Week. One men's bicycle and one woman's bicycle. There are 3 patios, all w/ mountain views. Read and enjoy a cool beverage and the beautiful mountain views and expansive green belt. You may take lessons and sign up with the Reed Anderson Tennis School on the Mission Hills CC property to play. Fees apply. You may also take lessons at Mission Hills CC Tennis (fees apply). If you are not a MHCC Golf Member, you may play next door at Mission Hills Westin Hotel. Fees apply. The Association has 4 pools and 4 spas. Usually, 2 are heated and are very close to my unit. SPA heat timers may need to be turned on 30 minutes prior to SPA use. 2 Bicycles (1 men's, 1 ladies'), 1 car detached garage, 6 minute walk to Golf Club House and the Dinah Shore Tournament Golf Course, 2 minute walk to the Tennis Club. If you love to play tennis, you can play tennis by signing up for Reed Anderson's Tennis School (clinics, private lessons, ball machine, etc.) You can play tennis every day at the Reed Anderson Tennis School located within Mission Hills Country Club. Contact Reed at 1-800-386-4107! Reed's Tennis School was voted Best Adult Tennis Camp in California for 2002-2012, 2014! I have been taking lessons from Reed for 20 years and for me, his school is the very best in the desert! Fees apply. Villa was very well appointed. Very clean and lots of appliances. We enjoyed being able to use the patios as there was always one in the sun or the shade to choose from. The pool was very convenient and we used it almost every day. Lovely Casita- Great location & views! We spent a month is in this lovely, comfortable, clean Casita. You will love the views and the beautiful property grounds. Citrus trees all around, we had fresh squeezed juice everyday! So close to several pools & hot tubs. The bed was soooo comfy too. The owner is a doll & makes sure you have everything to have an amazing stay. Walk or ride the bike to the nearby Westin & visit their Lobby Habitat...really cool. I was a guest of the owner for my second visit to the private Mission Hills Country Club and what a fabulous time I had. The unit is beautifully situated within 2 minutes walking distance to the Tennis Club and 8 minutes walking distance to the Golf Club House and 18th Hole of the Dinah Shore Tournament Course. We had a beautiful dinner outdoors at the 55th restaurant at the Club by the fire pits. The privacy of Mission Hills Country Club and the beauty of its landscape, abundant seasonal fragrant flowers and equally abundant fruit trees made this getaway a dream come true! The Villa is so clean and comfortable and has a view of the mountains from the front patio and the dining room patio. I love this healthy get-a-way and will bring my husband next time as we both love the peaceful, social and athletic opportunities Mission Hills Country Club offers. We enjoyed our stay. The mountain views are beautiful from each of the patios. So many good restaurants within a 10 mile radius. It was nice to have a garage so as not to have to worrry about parking. The unit was not as clean as I expected it to be. When we arrived the owner had all the sliding doors open and dust may have gotten in and left a gritty film. There was not a VCR or DVD as advertised. We could not get connected to the internet. The kitchen had everything you need to make a meal if you choose. I would advise to have someone check the unit on your arrival and at time of departure. I would also suggest getting renters insurance as we did so that problems could be resolved if needed. Dear Future Guests~~~ Please be assured there is and has always been, a DVD and VCR in our condo. As advertised, the DVD is built-in to the 32" flat screen TV in the bedroom. The VCR is directly under the 40" flat screen TV in the livingroom (and is the only item inside the cabinet this TV sits on). We have both wired and wireless internet access. Wireless internet accomadates 2 laptops. Except for the guest that said they could not get on the internet, all guests, including me and my family, have always been able to access the internet. The condo is cleaned by 2 cleaning ladies we use and many neighbors have used consistently for years. These ladies are meticulous in cleaning every aspect of the condo, including hosing down the 3 patios, cleaning the windows inside and outside and cleaning all the mirrors (including sweeping the garage). Most everything in the condo is brand new from a late 2011 remodel of the kitchen and the addition of new Italian floor tile in the entire unit. There are 3 new (lockable) screen doors so you can enjoy a spring breeze and hear the birds sing. There are new blinds in each room. We are confident the DVD and VCR will be easy to locate, the internet will be accessble and you will find the condo in wonderful condition. Enjoy! Mission Hills Country Club is located in Rancho Mirage, CA. It is a secure property with 4 secured main gates. Inside the secured gates, there are 1700 acres of flat lush, green grass, flowers, palm trees, olive trees and many fruit trees. MHCC is considered 'low-density' because there is so much square footage of green grass relative to the square footage of homes and condos. There are three private 18 hole golf courses at MHCC. The Westin Hotel next door to MHCC has public golf courses and a driving range. If you like to shop and take advantage of some great prices, don't miss the Street Fair at College of the Desert. This Fair sells knock-off purses, sunglasses, men's and women's clothing, jewelry, art, flowers, fresh foods, etc. For dining recommendations, we recommend Europa Restaurant for a romantic dinner on their patio, or for casual dining, the Tommy Bahama Cafe on El Paseo. If you can get a ticket to tour 'Sunnylands' the Annenberg Estate--do! It is 10 minutes from MHCC in Rancho Mirage. Eisenhower Medical Hospital in Rancho Mirage is a 10 minute drive from our condo. Check-in time is 4:00 PM. Check out-time is 11:00 AM. (An earlier check-in time and/or a later check-out time may be available. Inquire with the Owner in advance.) The first payment of $500.00 is due 5 days after a fully executed contract is executed between Owner and Guests. This is a deposit for Owner to use for holding the reservation for the guests and taking it off the market. It is non-refundable if guest cancels after the $500.00 is received by owner. The remaining balance (less the $500.00 reservation deposit) is due 60 days prior to arrival. A non-refundable cleaning fee of $175.00 applies and is paid at time of lease payment. The 10% Occupancy tax is NOT charged for leases of a minimum of 28 nights. Rentals during May - September shall pay the air conditioning bill for the days of their rental.